Ahhh....this is a very, very dangerous question. Similar to Crazy for Books, and I'm sure you all may feel the same way, too...I'd be super ecstatic to have my very own separate large library in my home. You know the kind -- the kind you find in London or Italy, dark wood, an open middle with a spiral stairway leading up to the second level...this is the closest picture that I could find. Oh my heavens!!! What an incredible room!!! WOW! That is so close to the picture in my head!! Reading the posts, it seems overwhelmingly everyone wants the big library. One day! Me too!! One day.. I can only wish!! I saw an awesome pic posted by another blogger last week... I will have to find it! Wouldn't that be a dream to have all that space. Love the pic. I think it would be fitting for all of our dreams. Thanks for the follow returning the favor. New follower. Omg! That's exactly the kind of library I want! 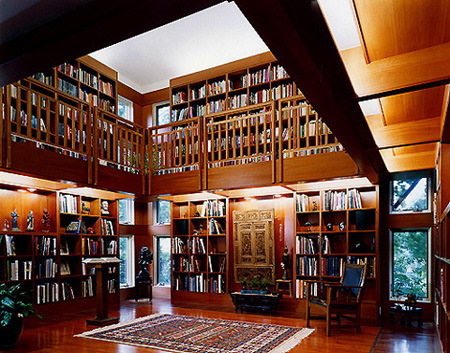 When we win the Lottery and build our own house this is the kind of library I want. I'm coming to visit when you add that on. I'll just sleep in the library! I love your library! Now that's what I want in my house....but I think I'd have to get another house to fit that library! Thanks for stopping by our blog, Brazen Broads Book Bash! Oh, yes! A library filled with floor to ceiling bookshelves, big comfy chairs - and a spiral bookcase, I hadn't thought of that - would be fantastic! Stop by my blog to check out our new Friday Wish-list Hop! Glorious! The only thing I would change in that room is the chair. A library needs a collection of big, pouffy, comfy chairs. The other thing I would have to add is time. My one bookish desire would be to have heaps and heaps of book reading time. How amazing is that Library/bookshelves!!!! *Sighs a sorrwoful sigh* I would love it! Mine is owning a bookstore!!! Gorgeous. I would never ever leave that room. sigh....me too....I want one to look just like that image. I also would love to have a home with shelves all over the walls, and am always trying to convince my husband that we need to find a house like that! Great minds think alike! Me too! That is one of my many book fantasies! Thanks for hooping by! I picked the same thing so I'm right there with you. Happy hopping! Thanks for stopping my my blog! I love that picture, and I am right there with you in wanting something like that! But failing that: I'd like a newly discovered first/first signed copy of Pride and Prejudice. HA! Then I'd probably sell it and buy the library. I love the picture you included...maybe one day!!! Thanks for stopping by my blog - did you see the giveaway I have going on? Hopping back at you....thanks for stopping by mine. Love that library! thanks for stopping by my blog! That is a great library-two stories of books! Sigh. I as well, would love a library that big for myself! Actually found a picture of one I would just LOVE! Oh this picture is to DIE for. That is exactly the library I was picturing when I answered the question today. Except I would like a larger window so I can see the garden outside. And I assume there is a fireplace in there too, just out of range of the camera! Whoa! I want that too- that library would be fantastic. Much better than my overloaded bookshelves! Thanks for hopping by. That picture is seriously beautiful. All that polished wood is making my mouth drool a little. Amazing choice. Have an awesome weekend! Hopping by from the Book Blogger Hop! I love your blog title! It is lovely. The warm wood is wonderful--and all those books! I would LOVE a proper library! Me too. Add a couple of dogs too. Oh yeah - wouldn't that be just amazing! I am with you! Thanks to everyone for stopping by! Please feel free to come by again! Love it:) my dream too...one day!! !